Proof-of-Concept Field Trial - BlueGreen Water Technologies Ltd. In its first proof-of concept trial BlueGreen Water Technologies treated cyanobacterial blooms with the innovative floating formulation that is the basis for its products. A single treatment resulted in the immediate reduction of surface cyanobacteria by 78%. Importantly, the cyanobacterial populations deeper in the water were also immediately affected and decreased by 56%. 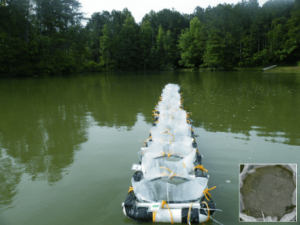 BlueGreen Water Technologies conducted its first proof-of-concept trial in June 2014 in an earthen levee fish pond (S-10 Pond, EW Shell Fisheries Center, Auburn University, Auburn, AL), using clear polyethylene sleeves (plasticpolybags.com), 6 mm thick, 2 m long and 40 cm in diameter. The sleeves were installed in three PVC floating ladder-like frames that could hold seven enclosures each. The polyethylene enclosures were kept open in the water with the aid of plastic hoops embedded at the top, center and bottom of each sleeve and were left open to the pond’s floor, weighed down with an iron chain at the circumference. A treatment (n=6) of 10 g/m2 of active NaDCC covered in a floatable coat was applied every morning over five consecutive days (day 0 in Fig. S1 was the first day). Three enclosures were kept with no treatment as controls. A ’Datasonde 4’ (Hydrolab, Austin, TX) probe was used to measure pH, temperature, dissolved oxygen, and specific conductivity in each water column. A light meter was used at 10, 25, 50 and 100 cm depth in each enclosure in order to determine the light extinction coefficient. The calibration of all probes was done according to the manufacturer’s instructions. Probes were rinsed in distilled water before entering them into the next enclosure. The level of total suspended solids was determined by calculating the weight of the material collected on pre-combusted and tared glass fiber filters (GF/C) which were dried at 55°C for 24 hours. A volume of 2 liters was collected at the surface and from a depth of 50 cm (using a bilge pump) for Chl-a extraction and total-chlorine monitoring. Chl-a extraction was done according to Sartory and Grobbelaar (1984). Samples were collected daily three hours after the morning treatment. Preliminary microscopical observation showed that the initial variety of phytoplankton consisted almost entirely of Oscillatoria sp. (over 95% of phytoplankton biomass) and ~130 µg/L Chl-a. A treatment with 10 g/m2 of the Lake Guard White™ caused average Chl-a concentrations on the water surface to be reduced by 78% 3 hours after treatment (p<0.05, Fig. 1A). By day 4, the average Chl-a concentration had dropped to ~6.5% of pre-treatment levels. By day 6, two days after the last treatment, averaged Chl-a levels in the treated enclosures had increased 9.6-fold since day 4, but nevertheless remained 4.3-times lower than in the untreated controls which peaked at ~390 µg/l (p<0.05, Fig. 1A). Concurrently, the average Chl-a concentrations at 50 cm below the water surface were also reduced by 56% within 3 hours from treatment. By day 5, an average of only 7.6% of the pre-treatment Chl-a concentrations remained (p<0.05, Fig. 1B). By day 6, the average Chl-a concentration had increased 5.7-fold since the previous day but still remained 2.6-times lower than in the untreated enclosures. A similar and significant effect was also observed with averaged pH-levels, as a slightly acidic pH of 6.38 was measured in the water column of treated sleeves within 3 hours after the first treatment, while a pH-level of 6.67 was measured in the controls. On day 4, a substantial pH disparity was measured between treated enclosures with pH 6.19 and untreated enclosures with pH 7.12. The significant difference between the two groups continued for two more days after the last application, with an increase to pH 6.23 and pH 6.61 in treated enclosures (measured at days 5 and 6, respectively) and to pH 7.17 and pH 7.97 in untreated enclosures (measured at days 5 and 6, respectively). In contrast to the significant reduction of Chl-a and pH levels in treated enclosures, all other averaged measurements including water transparency (with one exception at day 4, the last day of treatment, Fig. S1D), DO (Fig. S1E), total suspended solids (Fig. 1F), SpC (Fig. 1G) and water temperature (Fig. 1H) did not vary significantly and exhibited the same trends as in the controls. A visual example of the effect of the treatment can be seen in a representative photograph of the water surface in a treated enclosure taken on day 4: The water is relatively clear (Fig. 2A), while the water surface in an untreated enclosure became covered with the typical cyanobacterial scum (Fig. 2B). Total chlorine levels at the water surface were below detection levels within 3 hours after the treatment and were undetectable at -50 cm. Fig. 1. The effect of the Lake Guard White™ in enclosures vs. untreated controls, during and after 5 days of daily treatment (A) Chl-a measurements at water surface; (B) Chl-a measurements at a depth of 50 cm; (C) water-column pH; (D) light extinction coefficient; (E) water-column dissolved oxygen (DO); (F) total suspended solids (measured at the surface); (G) specific conductivity (SpC, measured at the surface) and (H) water temperature (measured at the surface). n=3 for controls, n=6 for treatments; bars represent standard deviation. The trial was conducted in a field setup as previous attempts to mimic the cyanobacterial dynamic in-vitro did not last more than a few days before untreated control populations spontaneously collapsed. As the pond’s most abundant phytoplankton was Oscillatoria sp., measuring Chl-a concentrations was a reliable method to evaluate initial changes in the cyanobacterial population in response to treatment. 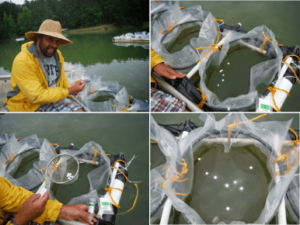 This trial showed that a single application of the floating formulation of 10 g/m2 Lake Guard White™ was sufficient to immediately reduce cyanobacterial populations at the water surface by 78% (Fig. 1A). Moreover, the cyanobacterial population in the water column was also immediately affected and decreased by 56% (Fig. 1B). This result was somehow surprising as chlorine levels could not be detected at a depth of 50 cm within a few minutes from application. The significant eradicating effect on the cyanobacteria was also evident from a physiological standpoint, as photosynthetic activity ceased and pH-levels dropped to ~pH 6.5 (Fig. 1C, Falkowski and Raven, 1997). These results are even more significant considering that the polyethylene enclosures were not sealed at the bottom of the pond, permitting ion equilibration and microscopic organism exchange with the surrounding environment. As stated above, total chlorine concentrations at the water surface were below detection levels within three hours, probably due to the chlorine’s rapid interaction with the abundant organic material present in the water. Its negligible effect on the environment was also apparent in the fact that no significant differences were measured between treatments and controls for water transparency (Fig. 1D), DO (Fig. 1E), total suspended solids (Fig. 1F) and SpC (Fig. 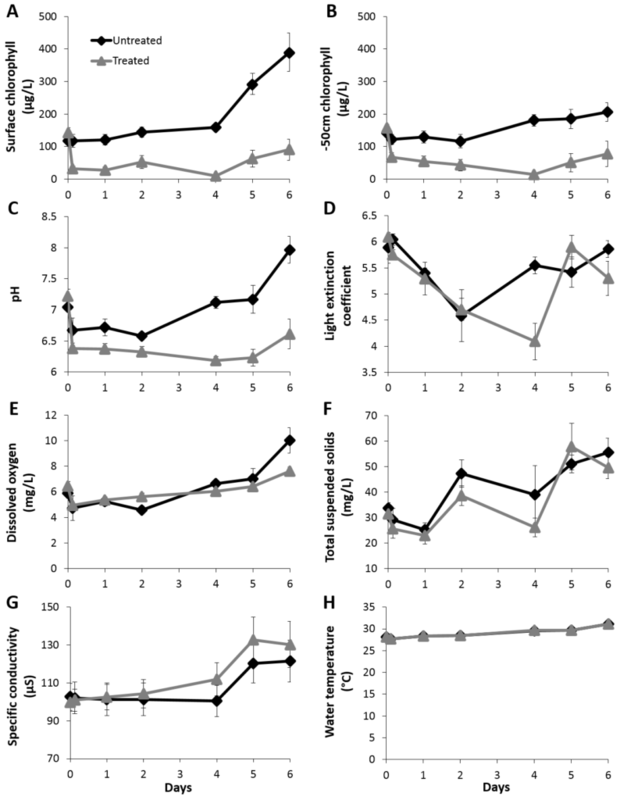 1G), with one exception on day 4 when water transparency at treated enclosures significantly increased (Figs. 1D and 2). It can, therefore, be concluded that the rapid decline of Oscillatoria in the water column during the first hours after the application was not related to a direct bleaching effect but rather to other diffusive mechanisms. Such a process, a.k.a. ‘quorum sensing’, may have involved affected cyanobacteria secreting “diffusive” signals to affect naïve cyanobacterial populations by either triggering an auto-catalytic cell death (Berman-Frank et al., 2004) or initiating a lytic cycle of lysogenic cyanophages (Deng and Hayes, 2008, Manage et al., 1999). After treatment ceased on day 4, water pH-levels increased in treated enclosures (days 5-6, Fig. 1C) in correlation with the rise of Chl-a concentrations (days 5-6, Figs. 1A-1B). This trend was related to the rise of eukaryotic algae in the treated enclosures. These species, namely Scenedesmus sp. and Chlorella sp., appeared to dominate the treated enclosures even 9 days after the last treatment (at day 13), both in relation to their basal numbers and in relation to controls (personal microscopic observations). It also suggested that green algae were less susceptible to the treatment, as was previously shown by Matthijs et al., (2012), and therefore could prosper in the ecological ‘vacuum’ created by the disappearance of cyanobacteria, where they remained for at least 9 days after the last treatment. Fig. 2. A representative photograph taken at day 4 of the water surface of (A) a treated enclosure vs. (B) an untreated enclosure, to visualize the contrast between treated and untreated sleeves throughout the assay. Enclosure diameter was 40 cm2. Deng,L. and Hayes,P.K. (2008) Evidence for cyanophages active against bloom-forming freshwater cyanobacteria. Freshwater Biology 53, 1240-1252. Falkowski,P.G. and Raven,J.A. (1997) An introduction to photosynthesis in aquatic system. Aquatic Photosynthesis (Malden, MA, ed.). Blackwell Science. p:1-32. Manage,M., Zen’ichiro,K., and Shin-ichi,N. (1999) Seasonal changes in densities of cyanophage infectious to Microcystis aeruginosa in a hypereutrophic pond. Hydrobiologia 411, 211-216. Matthijs,H.C.P., Visser,P.M., Reeze,B., Meeuse,J., Slot,P.C., Wijn,G., Talens,R., and Huisman,J. (2012) Selective suppression of harmful cyanobacteria in an entire lake with hydrogen peroxide. Water Research 46,1460-1472. Sartory,D.P. and Grobbelaar,J.U. (1984) Extraction of chlorophyll a from freshwater phytoplankton for spectrophotometric analysis. Hydrobiologia 114, 177-187.